Does anyone know if there will be elusive targets in Hitman 2016 after the release of Hitman 2? I basically just got the game and I didnt play them until I was done with the campaing… Ive only been able to do 2, and Im preety sad about it. I believe they have mentioned the possibility of new Elusive Targets using Season 1 maps. But I believe if that were to take place it would have to be under the HITMAN 2 system. So short answer is no. IOI tend to be very fluid with content plans and there’s so much to work through still for HITMAN 2 in terms of where to insert unlockables, rewards, escalations, and that also includes elusive targets. For now we have The Undying arriving in Miami on November 20. Previously IOI have said that Elusive Targets would be “once and gone forever”, but after 26 of them came out and the various full-season editions started to get released, IOI then announced the 26 Elusive Targets would come out one more time. This meant everybody who missed them during the Season proper had a chance to try all the ones they missed after The Complete First Season came out. None of the above were announced well in advance. HITMAN 2 is literally only a little over 24 hours old following its official release. I also feel that if I buy the second one Ill probably never play the first one again, or at least in a very long time. Well… that is where the dilemma is. As someone who missed around half of them and had a chance to only start with ET no. 15… I have to admit there is a magic to the “real timed event” aspect of it. You prepare knowing that if you foul up and “lock” the mission… this is it. You plan a bit differently. Feels more real. It wouldn’t feel the same if it started becoming this thing where the Elusive Targets always came back on a schedule. That said, during the 2nd run of the ET’s, IOI did it such that if you had ever killed - or failed - an ET before, the mission remained locked for you. So in that way, a 3rd run would only open for players like you who haven’t gotten them. I think another way to do this is that we have to do away with Season Separation for ET’s. With H2 + Legacy Pack we effectively now have one giant HITMAN game and I think it should be possible to actually run the past ET’s that are more than 1 year old as random re-appearances… under whatever HITMAN version is current. It would be interesting for example to re-live past ET’s (failed or otherwise) with the new gadgets and AI systems of HITMAN 2. The fact there will be more than 30, 40, or even 50 of them in total before long means they can still claim these are “Elusive”… because if only one of the one-year-past ET’s is coming back at random every few months you don’t know which one it is in advance. This would be different to the New and Current ET’s like Mark Faba who are announced well ahead of time. That is also the power of tags like this one: @Travis_IOI … so that we can make the community’s thoughts and suggestions known. Too much effort went into that Sean Bean ET for it not to be replayable. Thanks for the tagg! I literally just made the acount to ask this question. I feel kind of wierd that nobody else made it (that I have seen). But I do see why nobody else made it… they are supposed to be a one time thing. It just feels like I bought the game waaay too late and if anyone has this same problem the only real thing they can get from the first game is the patient zero and the escalation missions. When I played my first ET Ive never even seen the map because it was in the movie set one that I didnt eaven know I had… so it was completely improvised. I did not know the level map. I still only really know how to get traverse the last training mission and the Paris fashion show, the rest Im still exploring. I know the feeling… I originally missed 1 to 14. But the good news is you’re getting S2 No. 1 / No. 27 in the form of Mark Faba. ET’s are a community experience. You’re going to love it. That’s what Sean Bean is going to feel next week! oh and just like the John Wick thing there is a HITMAN phone app that is supposed to inform you of Elusive Targets. I don’t know yet though if it’s been updated to HITMAN 2. Map mastery is king for ensuring the ET’s count. When I got HITMAN The Complete First Season, Etta Davis (ET. No. 15) was active and I wasn’t familiar with the Marrakesh map and I only had a Jaeger 7 unlocked. I failed that one… which is a new kind of pain… You “failed the mission forever”. But that is part of the experience. And thanks for all the info btw!! 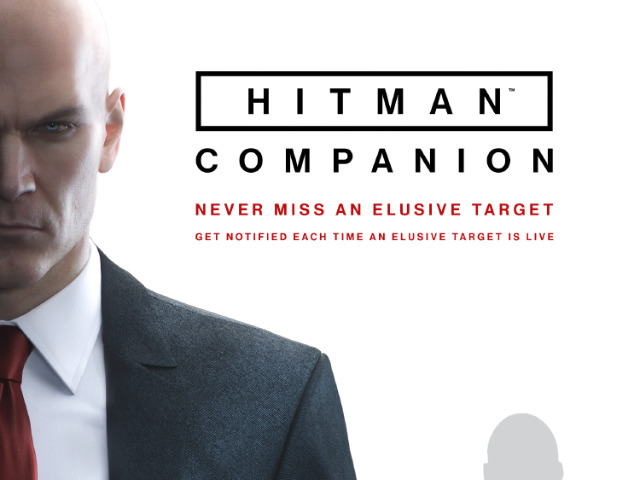 The app allows players of the Hitman console and PC video game to keep track of the game’s Elusive Targets and learn about in-game updates on their mobile devices. But it appears it was an app by Square Enix so maybe they discontinued it. Anyways stick around here… no ET goes by unnoticed. I will defenetly do that! +1 for a 3rd run of the Elusive Targets for Hitman 2016, please! Much like OP, I got Hitman 2016 not that long ago, in Steam’s Sale from July. I was and am pretty sad to find they were deactivated after last week. I only had THREE targets to go before getting the signature suit with gloves! 3! I’d be immensely grateful, as i’m sure many others, if we get another run of the ET’s to complete the ones we didn’t get the chance to, and their related challenges. 922812-040147: I agree that I’m really against those ET system. BTW, you made a mistake saying H1’s only advantages now were PZ and Escalations. It actually only is Escalations. Soupienza: Actually not all 26 ETs of H1 came back for a 2nd run. Only 25 of them. The Wildcard only came the first time. Additionally, I especially agree on this stupid system that makes it horrible for late buyers. I bought H1 late and the result was that I can’t get the ICA Outstanding Performance Coins. I know it’s not much, but knowing there’s content I’ll NEVER be able to get is terrible to me. My suggestion is, at the end of a Season, to let ETs be playable for free under a cool-down timer if you fail. What do you mean…you cant play Patient Zero anymore or is PZ in hitman 2 also? PZ is also in H2 with the GOTY Legacy Pack.